(CNN) - Top fundraisers for Republican Newt Gingrich's presidential campaign resigned Tuesday, the campaign confirmed to CNN. Fundraising director Jody Thomas and fundraising consultant Mary Heitman left the team. The two defections follow 16 resignations earlier in the month when top aides stepped down over disagreements with the former House Speaker. Gingrich press secretary RC Hammond said the campaign will continue. "Newt 2012 continues its reorganization to achieve a grassroots driven substantive solutions orientated campaign," Hammond told CNN. "We wish the members of the finance team who decided to leave the best. The campaign continues forward as committed as ever." No one wants to remain on a sinking ship. LOL. Gingrich ship should finally sink now. No campaign team and no fundraisers. Give it up Gingrich. Your ship has sailed and about to take a nose dive for the bottom of the ocean. 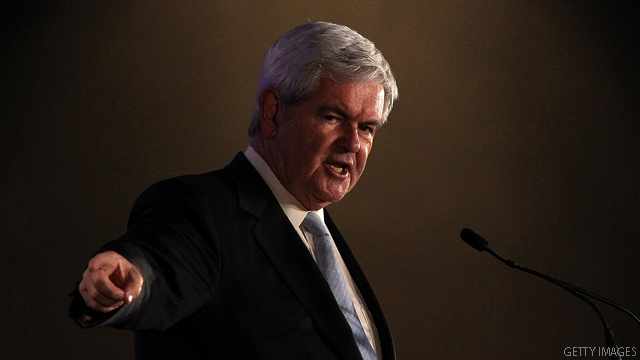 Stick a fork into Newt . He's done . Buh, buh, buh, another one bites the dust.